I frequently speak with people who run local businesses such as real-estate agencies, law firms, bike shops, and the like. These entrepreneurs are frequently interested in the ideas of real-time marketing, social networking, and content creation to grow their businesses but are struggling to find a way to create something of interest to their local market. 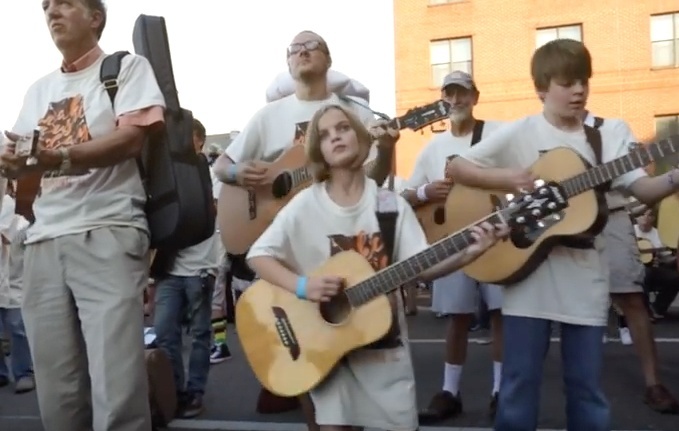 I just love how Spicer’s Music of Auburn Alabama brought their community together for Make Music Day in an attempt to create the world’s largest rock band. Over 850 people brought guitars, drums, basses, keyboards, ukuleles, harps, harmonicas, violins, trumpets, washboards and so much more to play Lynyrd Skynyrd's Sweet Home Alabama. The video is certainly worth a watch! Direct link to Community Comes Together for World Record Rock Band on YouTube. Tim Spicer of Spicer’s Music - @spicersmusic - a full-service music store in Auburn Alabama, founded his company with family members because they wanted to share music throughout their local community. They see the their business as much more than just a store, more than just selling instruments and offering lessons. Spicer’s Music engages the community with after-hours events. They bring bands into the shop for shows, offer a place for band rehearsals, and organize jam sessions. There are “camps” for musicians of all ages. The goal is to stretch the store as far into the community as possible. They certainly showcased their wonderful approach to business on that beautiful day this summer to play Sweet Home Alabama.